Sharpie-brand permanent markers are manufactured by Sanford, L.P., in Oak Brook, Illinois. 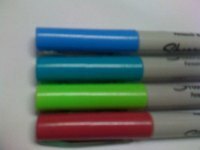 The primary components in Sharpie markers are propanol, butanol, diacetone alcohol and different dye colorings. The dye coloring used depends on the color of the Sharpie marker. The barrel of a Sharpie marker is molded out of a plastic resin. Screen printing is applied to the Sharpie barrel, including information like the Sharpie logo and the description of the color. A filament made out of a cotton material and used to hold the ink is inserted into the barrel. A needle is used to inject the permanent marker ink from the other end of the Sharpie barrel; at this end, the writing tip is also applied. The cap is placed on the marker, and the permanent ink slowly works its way up to the tip of the completed Sharpie marker. Small variations in the Sharpie-making process may occur depending on the specific product. Sharpie produces a broad spectrum of different permanent markers. Why Are Permanent Markers Permanent? Who Invented the Sharpie Permanent Marker?